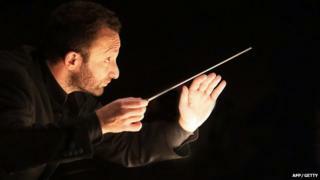 Kirill Petrenko has been elected as the new chief conductor and artistic director for the Berlin Philharmonic. He succeeds Sir Simon Rattle, who will leave the orchestra in August 2018. The Russian conductor was elected by a large majority of the members of the orchestra during an assembly yesterday. Last month an initial vote saw the orchestra members fail to agree on who should be their next artistic director after 11 hours of secret discussions. Petrenko, 43, is currently general music director at the Bavarian State Opera in Munich. He said: "Words cannot express my feelings - everything from euphoria and great joy to awe and disbelief. "I am aware of the responsibility and high expectations of me, and I will do everything in my power to be a worthy conductor of this outstanding orchestra", he said. "Above all, however, I hope for many moments of artistic happiness in our music-making together which will reward our hard work and fill our lives as artists with meaning." Orchestra Board members Ulrich Knorzer and Peter Riegelbauer said they were "extremely pleased that Kirill Petrenko has accepted his election as chief conductor designate of our orchestra. We look forward to our musical future together with great confidence." Sir Simon Rattle said he has "admired Kirill Petrenko for years, and I am delighted that he will be my successor with this wonderful orchestra". He added: "I congratulate the Philharmoniker on making such a forward-looking decision." Sir Simon said two years ago he would leave when his contract ended in 2018. He will join the London Symphony Orchestra as its music director. The Berlin Philharmonic, founded in 1882, has had three chief conductors over the past six decades; they were Herbert von Karajan (1954-89), Claudio Abbado (1989-2002) and Sir Simon Rattle (2002-18).